These are the last ones for now. My favourite Canadian fabric store! FYI: The bird pillow is purchased from Dwell Studio, I didn't make that one, just the pair behind it. But I still have a stash of fabrics, that I am itching to get at. Sorry for the next sappy bit. Lately my energy has been focussed on organizing university and scholarship applications for my eldest. It feels so daunting and overwhelming. I am having a hard time because it means that my "baby" is going to be leaving the nest soon. Hard to fathom that the little newborn you held in your hands is going to one day grow up to be the most amazing individual and will leave you to embark on their own adventures, ones you may or may not be part of. Have a fabulous weekend my peeps! Your pillows are lovely. It's gotta be so rewarding to make your own! My daughter's only in 7th grade, but I feel for you!!! The thought of her leaving one day makes me want to cry - sad tears, along with tears of joy for her (our) new chapter. I wish you lots of strength and love. LOVING these pillows!! I'm planning on making some from the same Dwell Studio fabric in the yellow! I LOVE the bird fabric! I seriously need to learn to sew. No matter where life takes our children, we will always be with them, Barbara. Distance is irrelevant when in comes to matters of the heart! Gorgeous pillows! My daughter is 7, and I can relate (every morning when the bus pulls away!) She's going to do great because of all your efforts & you are already awesome! 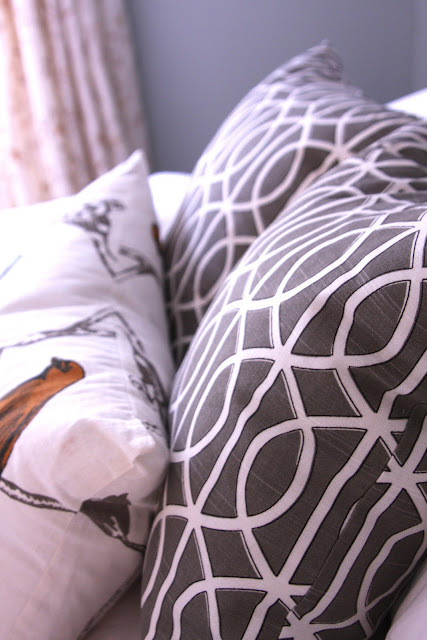 Love, love, love the combo of fabrics for these pillows. I love birds on things for some reason, even though I'm not crazy about them in real life. It's my eldest's birthday today, coincidentally, he's 23 and we just moved him into his second apartment (in six months) last weekend. So I can totally relate, but lucky for me he's in the same city and we visit often. Upward and onward, I say (at least that's what I tell myself when I'm feeling nostalgic). Your pillows are awesome! Nice job. And my little one just turned 1 in August but I can't even begin to imagine when she gets older. Bittersweet I'm sure. Have a great weekend!! Loving your pillows! I'm with Lisa, you should open up a store! Happy weekend to you. Who cares about the seams? The pillows are gorgeous... and big hugs to you... I'm not ready to embrace the day my daughter leaves the nest, and it's coming fast. You're a sewing fiend! Love your cushions, you talented girl you. Have a good weekend! Great pairing! 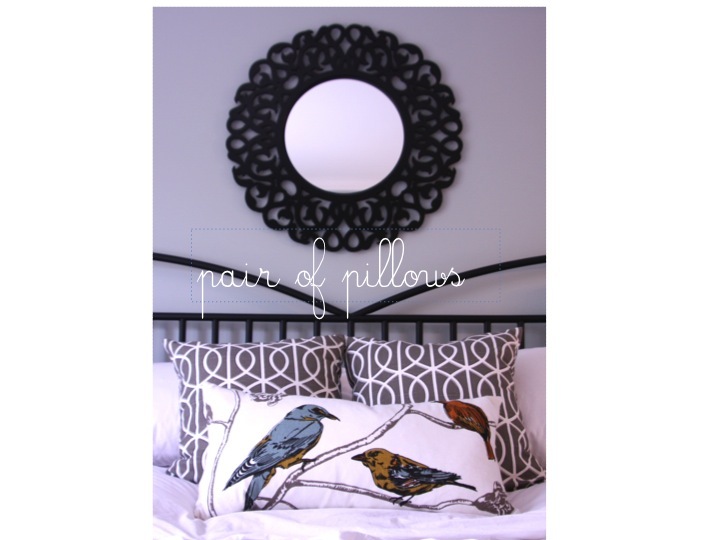 Love the new pillows with the bird print. So fresh! As a daughter who left home years ago (then got married), I can tell you its tough from this side too. Wish you & your eldest the best through this transition. I LOVE that fabric! I have a sample in teal that I'm contemplating using for window treatments. The bird cushion is cute too. No kids here, so haven't had to go through the letting go phase. Hope it isn't too traumatic for you! ohmygoodness!!! I get weepy even thinking about my kids leaving home! My stepdaughter is turning 16 this week... and I CAN NOT believe it! My boys are already older than she was when Jeff and I met. 'The days are long but the years are short', right? Gorgeous! Love the fabric choice Barbara! Barbara my two oldest are in college....Trust me, right now it may seem scary/sad/lonely to have them leaving. However, once you see them succeed on the their own you will be so happy for them and the scary/sad/lonely feeling starts to subside! Hang in there and feel free to be sappy anytime! BTW, the pillows are wonderful, love the colors! Love your cushions!.....Your kids don't leave you ...they start their own story and trust me you will be along for the ride! That pattern is perfect with the bird pillow. Love it. More beautiful pillows! And I absolutely cannot believe that you have a daughter old enough to be applying to college!